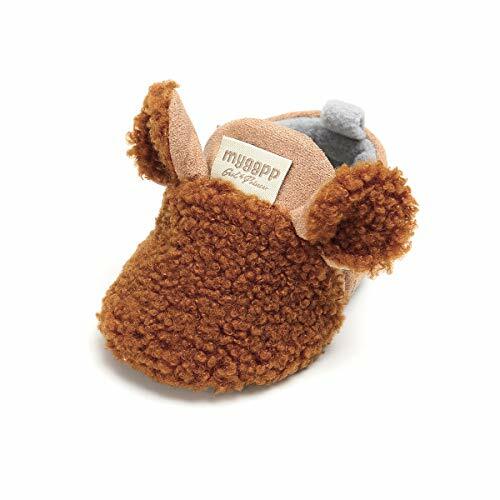 Tutoo Baby Boys' Girls' Shoes Cotton Cute Animals Slippers Prewalker Newborn Infant Crib Shoes (4.1 Inches (3-6 Months), B-Brown) by Tutoo at Spoil the Baby. Hurry! Limited time offer. Offer valid only while supplies last. Protect the baby's healthy growth. These shoes will look fabulous on your little angel and is perfect when the weather turns from warm to snuggle. Protect the baby's healthy growth. These shoes will look fabulous on your little angel and is perfect when the weather turns from warm to snuggle. Great to throw on with everyday outfits and can add warm and fun with some cute boots or a winter coat. Multiple Safety test, NO any stimulation to the skin of baby, mother rest assured. Soft and Wear-Resistant sole,Breathable and Warm.Fleece baby bootie with secure snap-button closure and comfort lining. 3 size available for 3-18 months baby. If you have any questions about this product by Tutoo, contact us by completing and submitting the form below. If you are looking for a specif part number, please include it with your message.